The DC Jet is an ultra-compact air-assisted ionizing unit. The direct voltage technology employed ensures that the DC Jet is still powerful despite its small dimensions. The air assistance increases the reach of the ions and also allows small particles to be blown off surfaces. The ionizing head of the DC Jet is attached to a modular hose. The ionizing units of the DC Line continuously supply positive and negative ions. 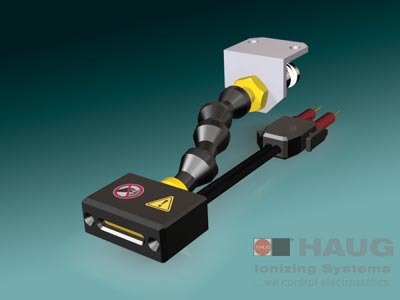 Due to the direct ion output, the ionizing unit is able to reach a high discharging performance for the neutralization of electrostatic charges. The two ionizing pins of the DC Jet are made of tungsten ensuring a long service life. The ultra-compact DC Jet comes into its own in tight installation conditions. The flexible modular hose ensures straightforward assembly and orientation of the DC Jet in stationary production systems. The length of the modular hose can be adjusted to the requirements of the production system. The flexible silicone-sheathed high-voltage cable allows small bending radii to be achieved during the installation and use of the DC Jet in moving production systems (e.g. robot arm). The high discharging output of the DC Jet allows it to be installed at a distance to the electrostatically charged surface of up to 100 mm. The DC Jet is operated with the discharging power pack EN 1 DC. This power pack allows the connection of HV cables with a total length of 50 m max. In combination with the operating voltage of 24V DC for the EN 1 DC, an ionization system for highly flexible use is achieved.